by Chris » 31 Mar 2019 11:25 am A young friend of mine, a would be Punch prof, is going to Turkey for a two week Easter holiday. He’s far more excited about the coming May Fayre Punch & Judy Festival in Covent Garden than his foreign holiday and every time he meets me he asks if I know how long before Covent Garden, and when I give some approximation he gleefully tells me to the exact day. In the 1980s I did visit Turkey since Istanbul was one of our ports of call when I was performing on The Calipso, a Greek cruise ship. I loved Topkapi, the palace which figured in a the film “Topkapi”, the classic jewel heist movie, and also St. Sophia, a former Greek Orthodox Christian cathedral, later an Ottoman imperial mosque and now a museum. Quite splendid! I searched but never tracked down Mr.Punch’s cousin Karagoz in Istanbul, although I did find him in Greece. But that’s a story waiting to be written up for the PunchandJudy.com website. This is Karagoz, a puppet folk hero in both Turkey and Greece. Unlike Mr. Punch who is a Hand Puppet this is a Shadow Puppet. SUNDAY MAY 12th, St Paul’s Church Gardens, Covent Garden. Mr. Punch awaits you. We have great pleasure in inviting you to attend the 44th Annual Covent Garden May Fayre and Puppet Festival to be held this year on Sunday 12 May 2019 to celebrate Mr Punch’s 357th birthday near the very spot that Samuel Pepys first saw Mr Punch in England in May 1662. The May Fayre will take place in the garden of St Paul’s Church, Bedford Street, Covent Garden, London, WC2. The day will start with a Grand Procession at 11am led by the Superior Brass Band, followed by the Special Church Service at 12noon, and performances from 12.30 until 5.30pm. We are hoping for lots of sun and friendly crowds again this year. With best wishes from Maggie Pinhorn, Amy Dyke-Coomes and the May Fayre Committee. 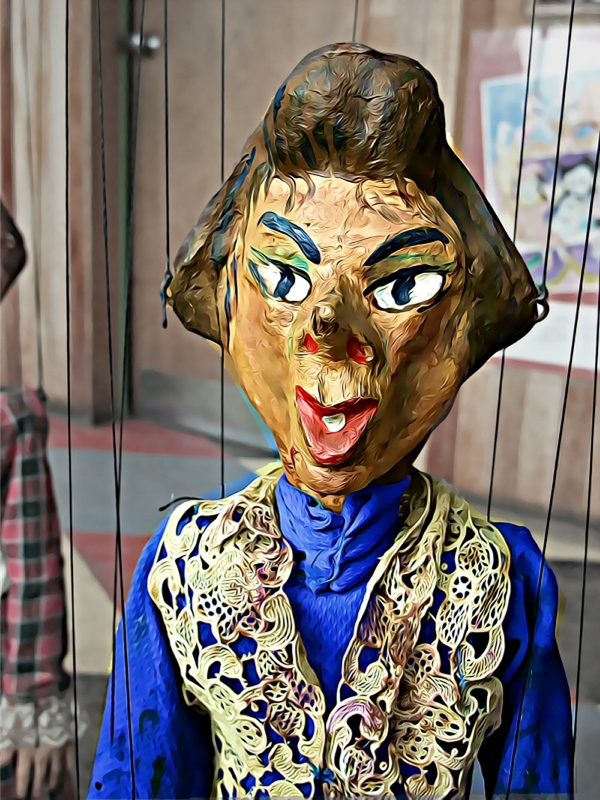 The Easter Production at the Harlequin Puppet Theatre will feature The Grand Puppet Circus, always a great favourite and featuring a large number of very unusual puppets. I always enjoy performing the Circus. Until then I’m also busy travelling around, especially at weekends, taking my Magic Tricks and Punch & Judy to children’s birthday parties. I’ve always enjoyed birthday party work, it’s one of those things that haven’t changed since I was a child. The world may be full of technology, and children may well be more competant than many adults, but even so we forget that they are born with exactly the same imagination, curiousity and sense of fun and wonder as were their parents and grandparents. I find that children today are much the same as always, and I’ve been performing for them professionally for the past half century. Children still respond to traditional children’s entertainment. They still laugh at Pantomime and Punch & Judy and Slapstick comedy, and still are fascinated by magic and illusion. or for Children’s entertainment fundays and fetes. 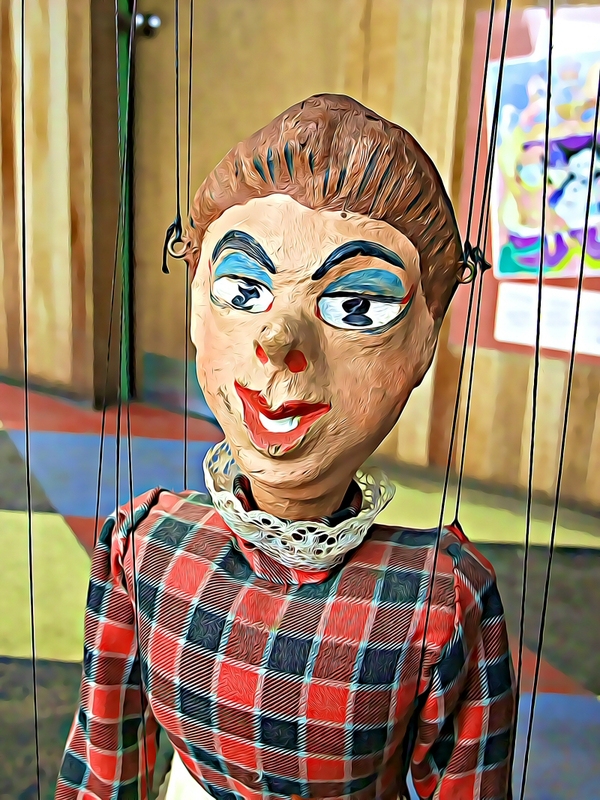 LAST TWO DAYS OF HALF TERM SHOW Our Family Puppet and Magic Show runs until Saturday March 2nd with a Variety of puppet and Magic entertainment that wil excite the Children and charm the Adults. The show starts each day at 3pm and finishes just after 4.30pm. 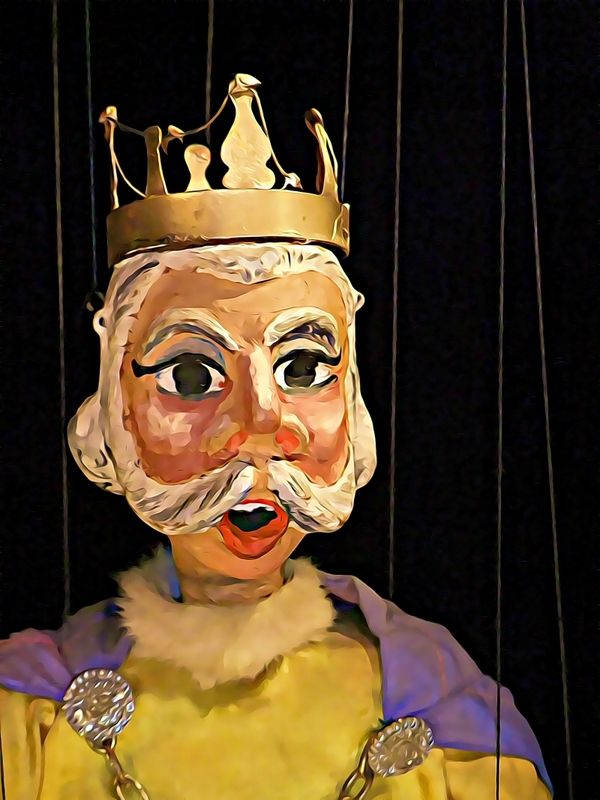 There is an ice cream interval in the middle and the show includes Mr Bimbamboozle’s Magic (with children helping) and a Puppet Play about a Silly King, A musical fantasy called The Handkerchief Princess, and a Marionette Cabaret showing just how the strings are pulled. 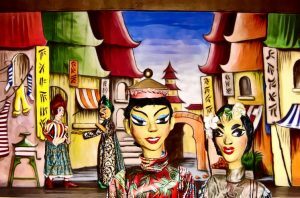 The show is in the specially built Harlequin Puppet Theatre on the sea front at Rhos-on-sea (LL284EP). Seats can be booked via http://puppetshow.info or reserved by telephone 01492 548166 Prices are £6.50 for adults, £5.50 for children or senior citizens. We don’t charge for babies. 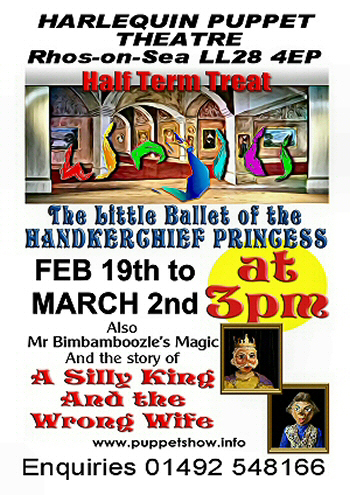 The Half Term Puppet and Magic Show continues until Saturday March 2nd. The first week has been relatively quiet with just a few families in each day. This has been nice, and as expected since the Welsh and English school holidays are not in sync for this half term. Many of our friends from Cheshire, Merseyside, Lancashire and the Midlands who have been staying with grandparents for their holiday are going back today, while the local children are still in school looking forward to their holiday next week when we hope to see them at one of the Puppet Theatre performances. The Little Ballet of the Handkerchief Princess has been proving very popular this year and I have had many pleasing comments. We are currently planning the Family Show to start on Bebruary 19th and to Run until March the 2nd. It will feature a charming little ballet about a princess and a wizard, and a funny unfamiliar fairy tale about a King who chooses the wrong wife. Our One-Man Christmas Family Show at The Harlequin Puppet Theatre is certainly attracting the audiences this year, with already one day completely booked out, and we’ve only been open for 4 days. The after-show comments from both adults and children have been exceptionally gratifying. Actually this is quite short season for we only run until January 5th because that is the last weekend before the children return to school for the start of the new term. The programme will also include a funny play Two Silly Women and a Very Silly King. There will also be Mr Bimbamboozle’s Magic and Chris Somerville’s MARIONETTE CABARET. Christmas is on its way…. It’s getting exciting now, I’ve started with the pre-school nursery shows. This means quite a bit of travelling which I don’t really mind since the rewards are plentiful. The Nurseries are all decorated and festive, the 3 and 4 year olds excited, some a little bewildered, as they file in to either sit in rows on tiny chairs, or sometimes in a semi circle on the floor. They make a lovely audience with a a good sense of fun and a trusting belief in magic. I concentrate on the magic for the very young ones. I do introduce puppets amidst the magic tricks, but rarely do a formal puppet show for the under fives. Of course with the primary school shows I am catering to bigger audiences (over 400 in some schools) and a wide age range. In these shows I feature Punch & Judy as well as lots of Magic Tricks. These very different shows, but I still enjoy them, especially with my regulars. Some schools have booked me every Christmas for the past 20 years and more. But between the various school shows I am of course rehearsing for the Christmas Show at the Harlequin which opens on Boxing Day. 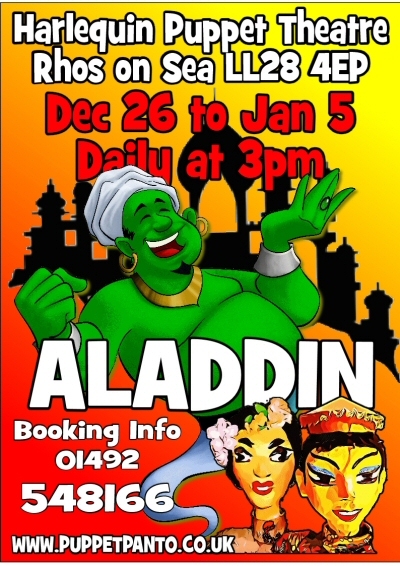 This year features “Aladdin and the Wonderful Lamp”. I haven’t done this production since 2014 so there’s a lot to remember and a lot to rehearse. It’s not only the puppets and their acting but also the scenery and lights. A two minute scene change from the Streets of Old Pekin to An Enchanted Cavern in the Mountains of Arabia is quite a feat for the solo performer and takes quite as much practise as do the actual puppets. The great thing is that it’s still fun. After over 60 years a professional puppeteer and it still excites me. Which is probably for the best because I suspect its too late to get a proper job! 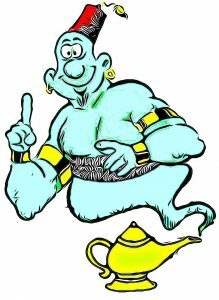 Rub the Lamp and I will grant your every wish! Posted on 7th December 2018 Leave a comment on Christmas is on its way…. And Soon it will be Christmas! On Saturday at 3pm we have the final show before the majority of children go back to school for the Christmas Term. We’ve been very busy this holiday, but not every day. Wev’e had some bumper days when the theatre has been almost full, but then other days when only a few families arrived for the show. Probably this is partly to do with the fact that we straddle several Welsh counties and several English counties in our catchment area, and their holiday weeks have not coincided at all. Although the October holiday is only a week we opened the theatre for two weeks so as to disappoint as few children as possible. Let’s see what Friday and Saturday bring. This programme has been very well received, and the play, “The Gooseberry Mandarin”, despite a quite challenging vocabulary, has held even the very young in rapt attention. Mr Bimbamboozle’s Magic is always a firm favourite, and the children do so love to point out his mistakes, and act as magician’s assistants. The adults appreciate the skill and humour demonstrated in the Marionette Cabaret. The children enjoy this too, albeit on a different level. Immediately this season is over we will be planning for Christmas. Scenery and puppets will come out of store and there will be strings to repair and much repainting and possible new costumes needed as we get everything ready for our December production of “Aladdin and the Wonderful Lamp”, a favourite pantomime story of ours and the basis of this years Christmas Show at the Harlequin Puppet Theatre which runs from BOXING Day until the end of the Christmas Holidays. Posted on 1st November 2018 Leave a comment on And Soon it will be Christmas!